A handful of teeny tiny bars of chocolate recently arrived in the post. Little bars of 53% dark Belgian chocolate, but they contain a small dark secret. They are not hand crafted artisan bars featuring single origin estate chocolate, although that would be nice, no, you eat these bars for your health. Some of us have been deluding ourselves for years that this is our main reason for eating chocolate. The Ohso claim? 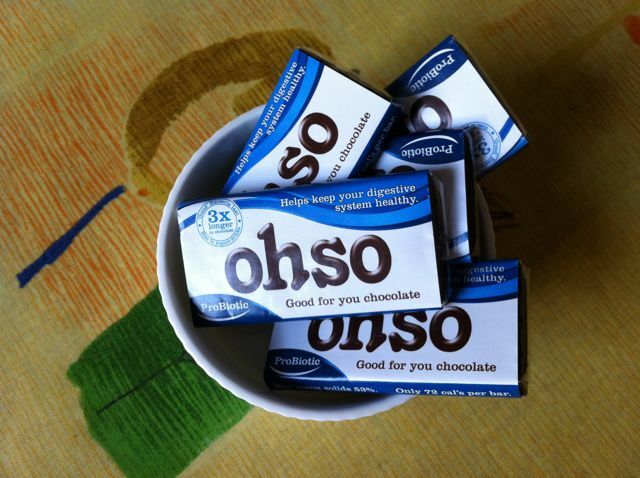 Weighing in at 13.5g and containing 72 calories a bar, they are packed full of healthy gut probiotics and these good bacteria last three times longer in chocolate than in milk products. This means that they arrive in better shape at the part of your gut where they do their good works. Plus chocolate is well known for its antioxidants and vitamins including D and E. These are, therefore, perhaps the ultimate chocolate detox. Packaged in packs of seven, the idea is that you have one for each day of the week, providing your daily probiotic requirement. The mini bars have 24 mini squares, which enables the bar to be savoured slowly if wished. Retailing at £3.99, these are available online at Ohso and also in health food shops and other independent retailers. OK, so enough of the health benefits, what do they actually taste like? The bar certainly smells chocolatey, with a sweet aroma emanating as soon as the wrapper is removed. Those first impressions are confirmed as the chocolate enters your mouth. It is pleasant with fruity notes, but is a little too sweet for me and resembles some of the mainstream dark chocolate bars which are widely available. Shame about them being too sweet as I don’t have the sweetest tooth although I do love chocolate and this sounds like a great idea….thanks for sharing the review. Thanks Deb. I agree, if they are meant to be healthy, keeping the sugar to a minimum would be more beneficial. Did you feel like your tummy benefited at all? I don’t think I had enough to actually assess the benefit. We have kefir pretty much every day, so I’m pretty certain I get all the good gut bacteria I need, even if it is with dairy. Hmm, sometimes I wonder why everyone is trying to reinvent the wheel. Why cant chocolate just be chocolate, ithas health properties to begin with like anti oxidents and eaten in moderation is good for you. Ooh – I like the sound of this! Sounds amazing! finally a good reason to eat choc and not feel bad! You mean you feel bad when you eat chocolate ………!!!! I have heard a lot about this chocolate on Facebook. I have to try it yet though. I have not seen these yet but would definitely like to try them. Why are people so deluded!! Look at the ingredients , the ingredient that comes first means highest content. Therefore this bar is nearly all sugar, I hate it when consumers are made fools of but we seem to be so easily led. Good for you, my backside!!. Must frequent the health food shops more frequently as I’d like to try this. Interesting though I’m not rushing to believe the claims.